I recently had the wonderful opportunity to interview my amazingly talented friend, Lauren from FictionTeaDesigns, who was extremely patient with me... especially since it took me a while to ask her the questions and I've been sitting on the answers since June... but it just goes to show how great she really is! 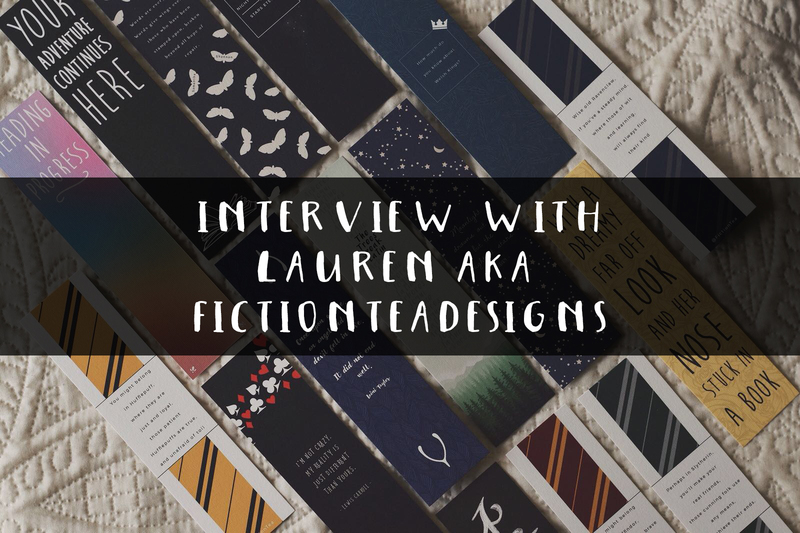 Since Lauren's business, FictionTeaDesigns, is now open for custom wholesale orders (and wholesale orders in general) I thought that now would be a great time to post the interview. 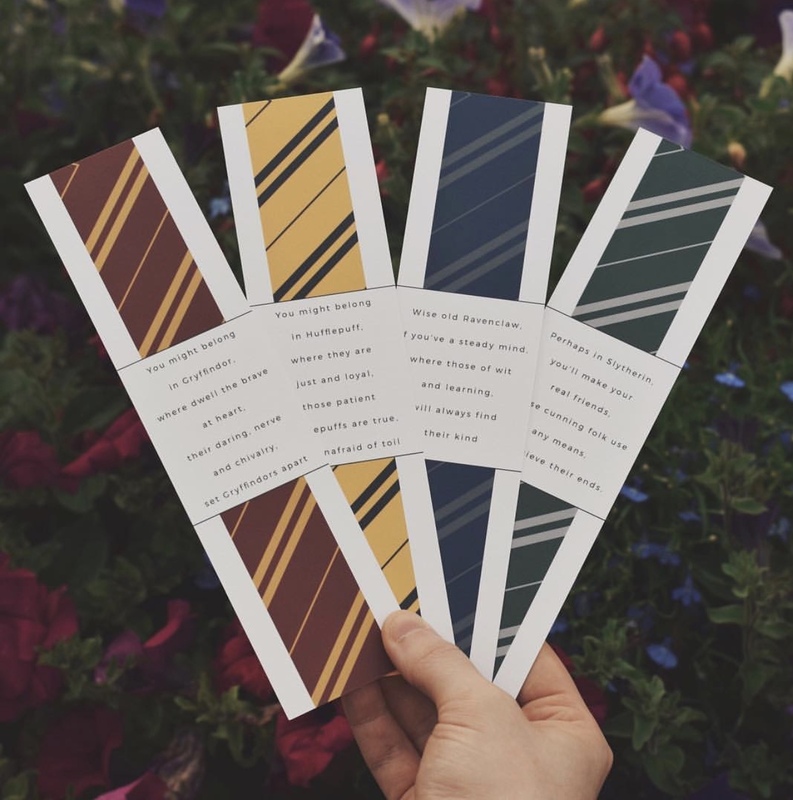 FictionTeaDesigns' bookmarks are super popular at the moment and she's just released new designs! 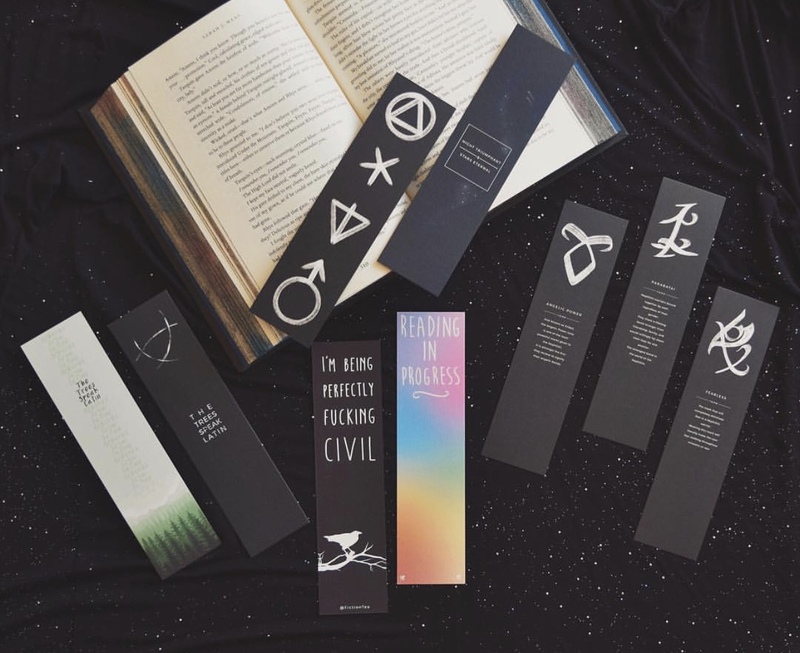 There are stunning bookmarks available for lots of different fandoms including Harry Potter, The Bone Season, Percy Jackson, The Raven Boys and more. There are also general bookish designs for those a part of too many fandoms to decide. Bonus! Read to the bottom of this interview to find a 15% off discount code, but don't wait, it's only active until October 8th! I know you’ve answered this question many times, but what made you choose the name Fiction Tea? I do get asked this so often, and honestly, I’ve wanted to change my username so many times, but friends and others in the book community have come to know me as FictionTea, and it’s grown on me, I guess. But what made me choose this name? I sat for an entire weekend, literally, writing out possible usernames, and most of the ones I liked were taken. So, come Monday, when I wanted to start my account I thought, screw it, I love Fiction, I love Tea. That’s my name. The rest is history! What was the reason you started Fiction Tea Designs? I studied Product and Graphic design through my last few years of High School, College and University. I always loved to design graphics or logos. It was my favourite part of the whole design process. So, I decided I wanted to combine my love for books and my love for design and do something with it. Bookmarks were the easiest option for now because I can offer my customers really affordable shipping, but in the future, I hope to expand to other things. What are the services that FictionTeaDesigns offer? Bookmarks, wholesale (for subscription boxes and whatnot.) and sometimes, book defacing/customisation. What’s your favourite thing to design for FictionTeaDesigns? I’m currently having so much fun designing the bookmarks, I currently have a whole list of quotes I want to put on bookmarks for my followers in fun and creative ways. The book defacing is also incredibly fun, it gives me the chance to get really creative. But, it’s really time-consuming too. What are some struggles you faced when starting your business? Trying to find my niche. The online book community has so many designers and bookmark businesses. I tried really hard to find my own style, and that’s when I decided to try and incorporate my adoration for minimal design into my bookmarks. 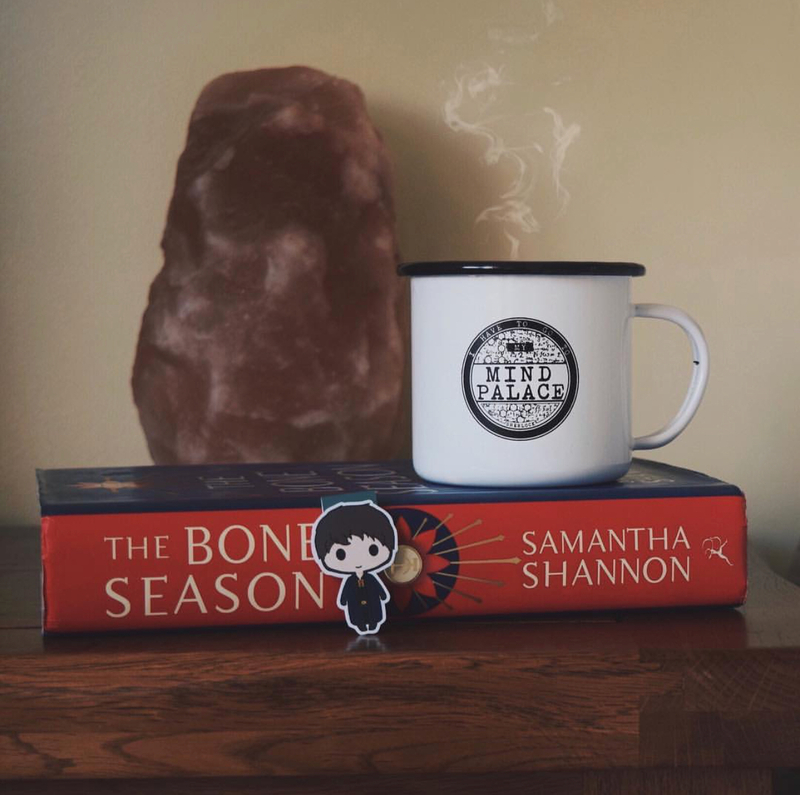 It makes them really easy to add into your bookstagram pictures too! What’s been an awesome experience you’ve had thanks to FictionTea/FictionTeaDesigns? I’ve had the chance to work with Fairyloot for an item in their July box. I love Fairyloot so much, I think it’s an amazing subscription service, so I was so honoured to work with them. I also got to do the lettering for my best friend’s book cover! Do you have any interesting (or secret-ish) plans for FictionTeaDesigns that you can share with us or hint at something? Well, I do plan on bringing defaced book customisations to the store in the fall. I’d also really like to try to bring things like posters and stickers to the store. But first, I am working on something top secret, that’s all I can say until I know it’ll work. Sorry, guys! Probably with Fairyloot, because they told me what the design had to go on and I had complete control over my design itself. We ended up with something very cool, and I hope all the Fairyloot subscribers out there like it. We love seeing your drawing videos on IG, how difficult is it to record yourself drawing for IG Stories? Do you enjoy doing it? Honestly, it’s not difficult! But then again, I’m resting my arm on another part of my desk the entire time. I have recently invested in a small phone tripod, so my future drawing Instagram stories shouldn’t be as wobbly, lol. What are your essentials for working? A good candle, relaxing music or fantasy compositions which inspire me a lot, tea, sketchbook, pencil and my iPad Pro. I’ve been sketching mostly on my iPad Pro recently, which is what you see in most of my Instagram Story videos. It’s honestly one of the best pieces of technology I’ve ever owned. Every designer needs one. What's a goal for FictionTeaDesigns that you'd to reach by the end of the year? I’d like to have added at least one more item to my store, whether it be posters, stickers, notebooks, etc. I’d also like to move away from the Etsy platform and have my own website to sell on. Now let’s get to know Lauren! I am currently twenty-three years old and I live in Scotland. I often get asked if I moved here, but no, I was born and grew up here. I love it here, there is really no place like Scotland. I wanted to be a fashion designer when I was little, then a game designer, and then for the majority of my life, I wanted to be a writer. That’s still the dream, but my occupation has definitely gone in the Graphic Design direction. Yes! Thanks to my Gran, who always bought me books and encouraged me to read as much as I could. Every time I stayed with her, we set aside two hours for reading before bedtime. It was always my favourite time. I did stop reading for a couple of years, but I started again in my first few years of High School when my friend and I found ‘City of Bones’ in the Borders closing down sale. Since then, I’ve been a major bookworm. If you had unlimited funds, which character would you cosplay at a convention? Oh man, I definitely have multiple answers to this! Most of them are Anime, so I apologise. As well as being a major bookworm, I’m also an Anime nut. I’ll tell you my top five characters I’d love to cosplay as. Blue Sargent (The Raven Cycle series) I’ve been told multiple times that I could pull this off easily! Is there a book or series that you regret reading? ‘Doon’ by Carey Corp and Lorie Langdon. There were so many things wrong with that book, I don’t know where to begin. My friend and I were genuinely insulted by the lack of genuine research into Scotland. What’s your ideal reading snack? Oh and Pop Tarts or cookies. What was your favourite children's book? Do you still have a copy? ‘My Secret Unicorn’ by Linda Chapman. The covers were just so colourful. Unicorns were my favourite animal as well as being the national animal of Scotland. And, the main character was called Lauren. I loved these books, I bought every one of them! And yes, I still have them all! I also really loved ‘Sleepovers’ and ‘Best Friends’ by Jacqueline Wilson. I’m pretty sure I still have those. Audiobooks, yes or no? Why? Honestly, I’ve never actually listened to an audiobook before. But, I plan on doing it soon! With ‘The Raven Cycle’ series when I re-read it. I do, not all the time. Maybe once or twice a year. I enjoy going back and re-reading my favourite parts or chapters of books now and then. It gets me all excited to start a new book. 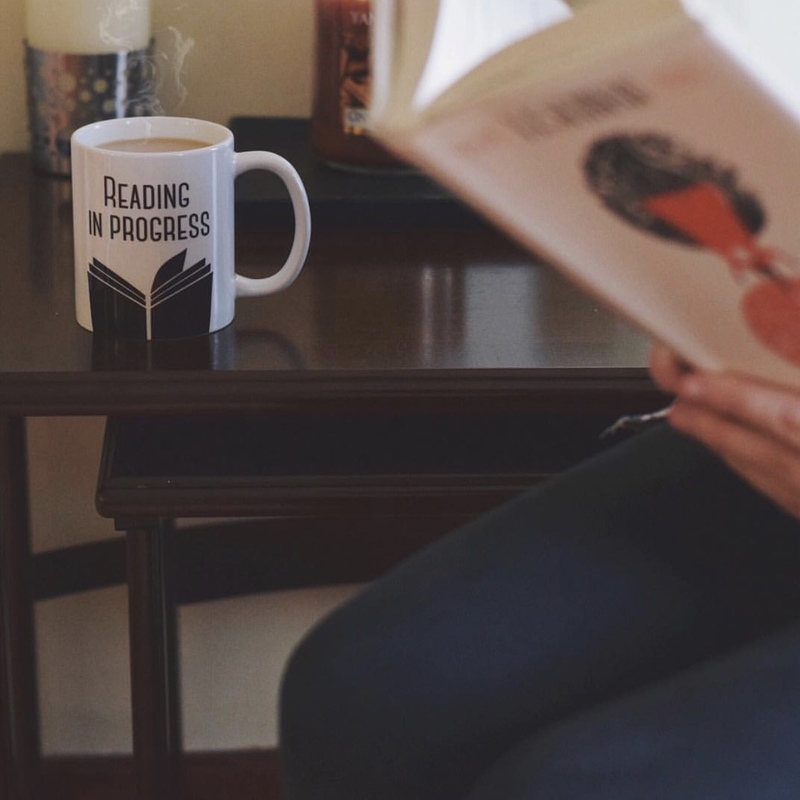 What bookish items do you collect? Magnetic bookmarks; specifically ones from HappyHelloCo. I literally have 80% of her Etsy store, and I’m still working my way through using each and every bookmark! 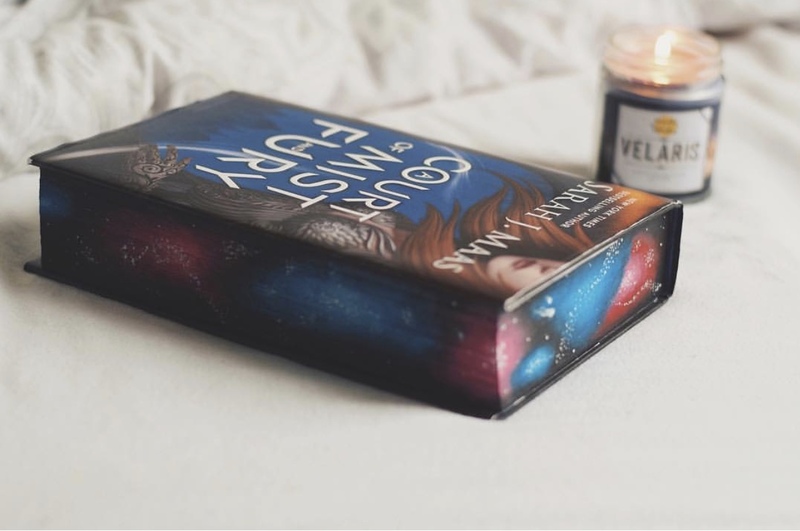 Bookish Candles; specifically MerakiCandles. A Scottish based bookish candle company who literally makes the most gorgeous scented candles I have ever sniffed. Also, my best friend is the owner, so that’s awesome, lol. What’s something that people reading this wouldn’t already know about you? Hm, that’s a tough one. Probably that I used to write online a lot, and I’ve actually completed a book online. However, I lost access to the account so now my book that I wrote when I was seventeen/eighteen is stuck on this website for anyone to read. I’m not going to mention where it is, because it’s so cringy, but at the same time. I’m still happy to say that I finished writing a story. I got halfway through writing and posting its sequel when I got locked out my account. Lauren has also been kind enough to give me a discount code to share with you all. From now until October 8th you can use the code BBOUTIQUE15 for 15% off your FictionTeaDesigns Etsy order! ← Click to be redirected to Etsy! PS. If you're looking for a custom wholesale design or looking for something customised for your blog then FictionTeaDesigns is definitely the place to go, just look at this adorable dragon Lauren designed for my blog! She took so much care with him and asked me about small details that I hadn't even considered! I hope that you enjoyed this interview and make use of the fabulous discount code that's available for a while. If you have any questions you want answering I'm sure that you can leave it in the comments below.